Innovation and quality are the foremost concern of our team; we make available the Compounding Clean Rooms that are flawless in every aspect, be it quality, functionality or durability. Moreover, we satiate our clients to the utmost by providing these Compounding Clean Rooms in the exact specifications stated by them. Lastly, we keep the price quotes to the minimal. Our Compounding Clean Rooms provide the ideal environment for compounding sterile injectables and other critical operations. Designed to meet the requirements of USP-797, they include the HEPA filter/fan units that provide a total of 1950 CFM of 99.995% particle-free air (measured at 0.3µm diameter), far exceeding the ISO 8 condition stipulated by USP-797 for compounding clean rooms. 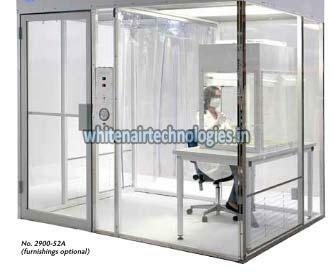 In fact, the primary processing area meets ISO 5 (Class 100) cleanliness standards.